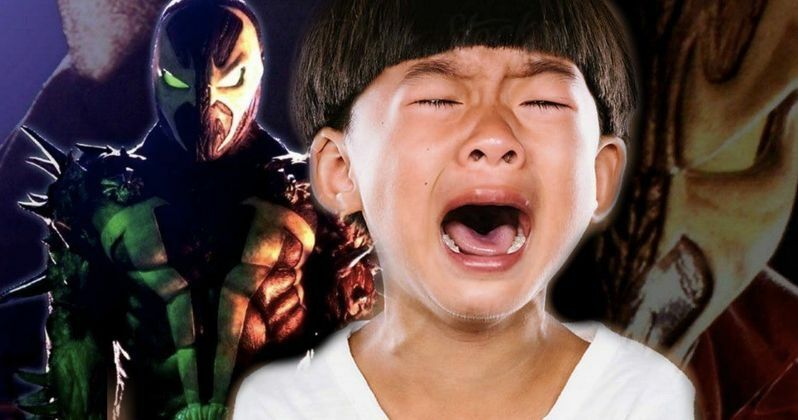 Todd McFarlane wants the Spawn remake to be so dark that it makes children cry. McFarlane was in attendance at this weekend's NYCC and took some time to talk about R-rated superhero movies and his struggle to get Hollywood to bend to his vision. The Spawn creator has been hyping up the remake for well over a year now, announcing the R-rating as a badge of honor. Todd McFarlane also created Venom, and this weekend saw the debut of the character's big screen adaptation, which was originally thought to be R-rated. Many comic book fans were disappointed in Venom and felt that it could have been much darker and faithful to the comics if it had an R-rating. Todd McFarlane is also in this camp and he believes that he knows why the movie ended up like it did. McFarlane doesn't want the Spawn reboot to end up in the same boat. He had this to say. "Here's what I'm trying to get Hollywood to understand because they still don't quite get it is I want to do a dead serious, scary movie that happens to be a superhero, right? And so they keep tripping into this superhero part and I wish I could almost take that piece out of it." Todd McFarlane also noted that Venom was teased as an R-rated film before it got labeled as PG-13. However, he always knew that it wasn't going to be as dark as he envisioned. He says, "they're not going to go dark in my definition of dark or Jason Blum's definition of dark or Greg Nicotero's definition of dark," which sounds about right. Especially after what McFarlane says about the Spawn remake next. He explains. "We're talking that it would make your kids cry. If you're going to do dark R, make the children cry who are under 10. That's the movie. Do I think that The Joker is gonna make 10-year-olds cry? Nope. Would I make them cry? Sure, I would because I'd be doing a movie for adults." Spawn isn't going to be aimed at children, according to Todd McFarlane. He states that he's not a corporation and has no need to go out and sell "t-shirts and hats and all this ancillary stuff," to get his movie made the right way. Venom could have been a lot darker and closer to what fans love from the comics, but that would have alienated some of Marvel's young fan base. But, if Sony would've taken the movie in the direction that McFarlane is talking about, there would more than likely be a lot less brutal reviews. Venom opened with a record-breaking October box office debut, which could have to do with the PG-13 rating. However, will Todd McFarlane's Spawn remake get close to those numbers? He wants to make a horrifying R-rated film aimed at adults, which takes the superhero idea out of the project. It's a risky bet, but McFarlane has Blumhouse along with Jamie Foxx and Jeremy Renner on his side. Let's hope that McFarlane gets to make his dark vision a reality. You can read more of the lengthy interview with Todd McFarlane over at IGN.